CBD Oil Review rates Fab CBD with three stars because it qualifies for the Quality, Mission & Safety Badges. Nutrition is the answer, that’s the motto enthusiastically proclaimed by Fab CBD. Fab CBD got their start searching for natural solutions that could mitigate reliance on over-the-counter medications for pain and inflammation. Their products are nutrition and performance driven, meant to bring out the best in a healthy lifestyle. We’re impressed by their full spectrum oils, high in quality and rich in terpenes, but we’re not psyched about the topical salve due to a nasty ingredient unfortunately, we’ve been seeing a lot of these days. The Fab CBD team, under the direction of founder Josh, claims to have over 25 years of experience in the health, fitness, pharmaceuticals, and supplements spaces. Their beginnings were catalyzed by the desire to improve the health of family members with chronic conditions and dependence on over-the-counter medication. 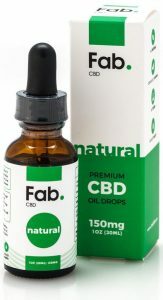 Fab CBD describes themselves as “nerdy”, creators of a community of like-minded “health nuts” looking for natural solutions. Fab CBD employs a clean CO2 extraction method and sources their hemp from Colorado. Their plants are grown following best organic practices, meaning no pesticides or chemicals. They display a high level of transparency that we love to see (and often don’t) by posting ultra-current lab tests for purity and contaminants and listing all ingredients for each product. They also have a lucrative points/rewards system meant to foster a sense of community and keep customers coming back. 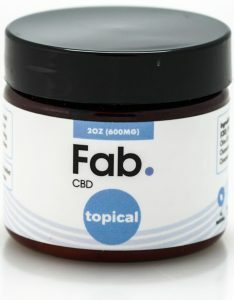 Fab CBD offers three categories of products, all in the $50 range. Their full-spectrum CBD oil drops with MCT oil come in mint, citrus, and natural flavors. While they don’t have a pet line specifically, they recommend the natural flavor for furry companions. Next up to bat are the vegan, fruity CBD chews. These are made with isolate, and although they contain no artificial colors or flavors, the chews are curiously not gluten-free. Organic glucose syrup, a wheat-based product, is on the list of ingredients, so those abstaining from gluten products will have to sit these out. Last on the list is the muscle and joint topical salve. It has ingredients we approve of, including aloe, cocoa butter, and blood orange essential oil, but there’s a dirty compound in the mix: polysorbate-60. Much to our chagrin, we’ve been seeing a lot of this lately in CBD topical products. The polysorbates are derived from sorbitol, a natural ingredient, but what makes them sinister (not to mention carcinogenic) is that they are treated with ethylene oxide: 20 parts in polysorbate-20 and in this case, 60 parts for polysorbate-60. The higher the number, the higher the contamination risk. We will still award the Quality Badge, but we hope Fab CBD will reconsider their use of polysorbate-60. There are numerous companies in this space that use other emulsifying agents to get the job done; beeswax and borax are great examples. Fab CBD sources organically grown hemp from Colorado and utilize CO2 extraction. Fab CBD pioneers next-level health and performance via science and innovation. 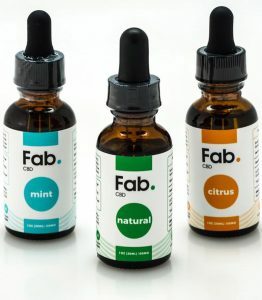 Fab CBD stays current on their testing and regularly posts comprehensive COAs for each SKU conducted by ProVerde Labs. To say that polysorbate-60 is carcinogenic in this way is entirely irresponsible. A pile of cosmetics and shampoos use it as an emulsifier and it is also found in imitation cream, pickle juice, and desserts. It's found in medical products like acne creams, cold sore creams, and treatments for yeast infections. It is one of the more common emulsifying agents out there.That being said, IN HIGH DOSES it can be toxic and a carcinogen. However, the key there is "HIGH DOSES". The FDA regulates it's use and has deemed it safe in limited quantities. According to the FDA it may not exceed 0.61% in foods or more than 0.66% in combination with other polysorbates. Confectionary coatings and cocoa products have an even higher limit of 1% of the total product weight. As long as it's within those limits it is safe and not a "HIGH DOSE".Fab's product is safe for use and does NOT contain HIGH DOSES of polysorbate-60. Publishing this the way you did about polysorbate-60 is uneducated fear mongering. Hopefully, people will do their own research when looking into this "sinister" ingredient.